First, please check out our new Pelican Parts Accessories section for gift ideas that will always come in handy. 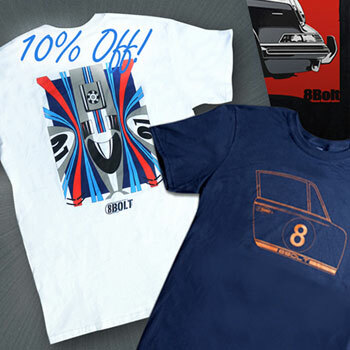 You'll also want to browse our Father's Day sales and promos, which include 10% Off 8Bolt Racing Tees. Stéphane Dufour's 8Bolt line turns iconic racing moments into stylish, wearable art. These handsome tees are 100% cotton and screenprinted in the USA. Promo code = 8BOLT10. Offer ends Tuesday, 6/21. Plan on doing a little maintenance on your Benz this summer? Find the parts you need here: Pelican Parts.com - Parts, Accessories and Technical Information for all Mercedes-Benz Automobiles. For One Week Only Receive 10% Off All MAHLE Filters For Your Mercedes! How can I make my 1998 E320 safe in the snow? Father of 3 month old daughter. 2 malfunctions and I've only owned the car for 1 week. I'M LOOKING FOR A FATHERS DAY GIFT, HELP ME!